Q: Are calcium reactors complicated? A: No, calcium reactors are in fact very low-tech devices; they just look complicated because of all the attending equipment. Essentially, a calcium reactor is a sealed vessel; filled with calcium based media and an external circulation pump which constantly cycles water in the reactor through the media. 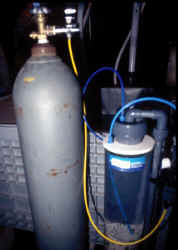 The reactor is also connected to a metered source of C02. This CO2 is bubbled in at a slow rate to mix with the circulating water and via chemical reactions, dissolves the media into calcium carbonate. Q: How do I hook up my calcium reactor? A: Well, there are a couple of components, and pieces/parts which you will need in advance to get your reactor working. Typically, the reactor is fed with water from the tank, either from special plumbing, a T-connector in your return line, or a siphon. You will want to have this worked out before you start. You can then fill the reactor with media, and then complete the plumbing. Make sure you leave plenty of slack in the various lines for maintenance. Of course, you will also need a source of CO2, and bottled sources work best for this purpose. The connection between your CO2 tank and reactor should be plumbed with CO2-proof tubing. You should apply Teflon plumbing tape to all large threaded fittings, including your bubble-counter to help prevent leaks. Once these are in order, you need only drip the effluent at a slow rate into your tank. Q: Is CO2 gas dangerous? A: The official designation of CO2 is Non-Flammable. While CO2 is not classified as dangerous like chlorine gas would be, CO2 can most certainly be toxic. If one were to breathe only CO2 you would quickly asphyxiate. CO2 is certainly worthy of respect, and is a compelling reason to be diligent about avoiding leaks in the CO2 portion of your reactor. Q: Do I have to use bottled CO2, or could I just as easily use a yeast-reactor or similar mechanism for adding the CO2 to the reactor? A: While it is certainly not a requirement, it is perhaps the most consistent means of applying CO2 to your reactor. After the initial cost of the bottle, the refills are on average about $10 or less for a 10-pound tank. Yeast reactors require constant maintenance, and can't really keep up with the demands of a calcium reactor. Q: Is this the only way to supplement calcium in my tank? A: No, there are many options of which the reactor is only one: two-part solutions, kalkwasser, and natural processes are all viable mechanisms for calcium additions to your tank. The most compelling reason to use a calcium reactor is to stay ahead of demand from the tank inhabitants, and as a side benefit, to automate the supplementation. Q: If my calcium is already low, will a calcium reactor help? A: The quick answer is yes and no, and in fact you can make your problems worse if you're not careful. Like any supplementation, one needs to move slowly as this equipment is brought to bear on your system. The effluent - the stuff that comes out of the reactor - can have a very low pH and this can in turn shift the pH of your tank towards the more acidic end of things. A well-tuned calcium reactor can easily bring low calcium levels up to a more useful level, but it's best to have things in the right range before you start adding effluent from the reactor. Q: Fair enough, is there a recommended flow rate of CO2 into the reactor, and a recommended flow rate out of the reactor? A: Again, this will vary from system to system, and there is a direct relation between the CO2 inputs, and the effluent outputs. The best way to explain would be to imagine we are talking about a Cool Aid reactor, we have a container of rocks that turn into Cool-Aid, and the CO2 dissolves the rocks. If you constantly add CO2, but barely let out any of the juice, the juice will become very concentrated. The opposite is also true, if you let water flow out of the reactor at a high rate, but don't add much CO2, the resulting effluent will be very weak and watery. Somewhere in the middle there is balance. Q: That was a terrible example, what else you got? A: Sorry, say this time we've got a container full of crushed coral… and the CO2 will slowly dissolve the crushed coral. The same applies, except in this case we are more concerned with the pH and dkH of the effluent rather than if it is tasty, Cool Aid. These two factors are now crucial because they will affect the calcium uptake of your reef-inhabitants in addition to other chemical processes going on in your tank. So, the take home message here is this: you must test quite frequently when you first set up the reactor to arrive at a drip and bubble rate which works best for your tank. Q: What is the target(s) I am shooting for? A: Again, this is subjective - on average, a dkH of 8 - 12 is considered good. A calcium level of 350 - 400 is likewise adequate. Your pH will vary over the course of a day, but should be in the range of 8.0 - 8.4. The effluent should be have a pH range of 6.5 to 6.8 - the dkH should hopefully be at the least 20, or even off the scale. Q: So are you telling me I just bought an alkalinity reactor? A: In essence, yes - the calcium reactor excels at replenishing the alkalinity/buffers in your system. It just so happens that the replacement solution is high in calcium, so it's a win-win as they say. Q: Hey I still have more questions, may I ask another? Q: Please, I've still got a lot of questions. Q: Sweet. What kind of maintenance do I need to do? A: Ahh, good question. The media will have to be replaced on a regular basis. How often will depend on how heavily the media is being consumed. Probably best to check every three months at the start, and as time goes on you will find a better period in which to renew the media. In the interim, the best thing you can do is give the whole reactor a good shake, once a month. This is a good reason to make sure you have a good amount of slack on the various lines connecting the reactor. When you swap in new media, you might also check the circulation pump, and clean if necessary. Q: OK, last question… can this new calcium reactor keep my calcium at 450+ and a dkH of 12+? A: It could, but would that be wise? More often than not, keeping both of these numbers simultaneously high is difficult if not impossible. In most cases, dkH and high calcium PPM are mutually exclusive. A given quantity of water can only keep so much calcium in solution [dissolved] before it is saturated [can not dissolve any more calcium] and the excess will form a precipitate - the snow phenomena that you have probably heard about. Real world numbers are somewhere in the middle of the "ideal range" and not at the high end of the scale. Q: Sorry, next to last question: What should I be using for media? A: There are a number of brands and also the option of making your own. You should avail yourself to other calcium reactor users to see what their preferences are. If you choose to make your own, you can crush dead coral skeletons with a hammer [don't forget the safety glasses] and put this directly in the reactor. Q: This is really a lot more than 10 questions, I've got another: what's the solenoid on the CO2 regulator for? A: Mainly to avoid excess CO2 from escaping the system during a power failure. The solenoid can also be hooked to your light timer, so that CO2 is delivered only during the lights-on hours. You can also connect the solenoid to a pH controller which will turn the valve on and off based on a preset pH. A pH controller is not a requirement, but most certainly useful. Q: Wait, you just said something about running only during the lights-on hours. What's that all about? A: Well, this is depends mostly on what's going on with your tank. Some people have problems with depressed pH [more than usual] at night. By turning off the CO2 at dark time, you will increase the pH of the reactor's effluent, and reduced its impact on the tank's pH. Q: Oh man, I didn't buy a pH controller… do I "have" to have one? A: No, you don't, but you should certainly have a pH test kit handy, and probably stock up on reagents while you are at it. Speaking of tests, if you don't already you should also have a dkH [hardness] test kit and calcium test kit within reach. You shouldn't hook up your reactor without them. Q: Does CO2 affect photosynthesis? A: Absolutely, yes. Without CO2, there is no photosynthesis - it is a major input in the process. Q: Is excess dissolved CO2 a problem? A: It most certainly can be… and often seen as the source of a depressed pH, or say lower than normal. In many modern reef tanks, where there are skimmers, sumps with spill-over weirs, strong circulation and the like, the water is well aerated and so excess carbon isn't usually a problem. Likewise, if you've got a good crop of photosynthetic corals or macro algae, these are going to be quite thankful for the extra CO2. Q: How can I tell if I have excess CO2 in my tank water? A: Easy, take a sample of your tank water and measure the pH. 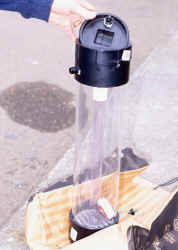 Then, put an air pump to work on aerating that same sample, and let it go for 6 to 12 hours. At the end of your test measure the pH again. If the pH has gotten higher [by two or more tenths of a point] then you probably have excess CO2 in your water. If not, you need to look for other causes. Q: Can I also dose kalkwasser while I am using a calcium reactor? A: Sure you can, but you will probably have to reduce the amount you have been dosing up to now. Always start by measuring your calcium and make sure you need to do this at all - with any luck, you can put your kalkwasser away. If your calcium is lower than desired, kalkwasser is a great source and can help push a low pH in the opposite direction [if that's what you want]. The possibility to create havoc with kalkwasser additions is really quite real. Regardless, you should always test before and after to make sure you're not doing something drastic. Similar to other additives, you can really put yourself in trouble if you add wholesale without testing first. Q: So what is my baseline? Where should I start? A: I would start with the manufacturer's directions. Most that I've read come with a recommendation for a bubble rate from the CO2 and a drip rate for the effluent. I would personally divide these in half and start from there. For the first week, you should test your tank and the effluent several times a day. Once you become more familiar with the equipment, and the affects of the various adjustments that can be made, you can test a little less. I still keep on a regular test schedule to make sure everything is within normal tolerances. A: Well, that depends - I suppose the quick answer would be, don't panic, even though that may seem like the most appropriate thing to do. Anything you might need to do would need to be affected over a longer period of time, so quick reactions may make problems worse. If you take your time setting up, and performing tests you can avoid problems before they start, yes? Q: Just thought of another question: what's the second chamber for? A: Ah hah… you've been shopping around. Most commonly the second chamber is either for additional media to be exposed to CO2, and thereby increasing the amount of effluent, say for a very large system. Or, this is chamber is only filled with media but not provided a CO2 source, becoming a passive reactor. In this design, the effluent from the reactor is then run through this second chamber to let the low-pH/high dkH go to work on the raw media within, and as a result gaining a rise in pH of the resultant effluent coming out of the second reactor. Q: Sweet, can you come over to my house and set up my calcium reactor? A: Book the flight, board my dog, feed my fish, and let my employer know I won't be in tomorrow and you've got a deal.